Since at least 2950 BC, jade has been treasured in China as the royal gemstone. Jade is a bridge between the spiritual and the material world. The Chinese character for jade, yu , resembles a capital I with a line across the middle: the top represents the heavens, the bottom the earth, and the center section, mankind. To this day, many people believe that jade will protect them from harm. Jade was thought to preserve the body after death and can be found in emperors&apos; tombs from thousands of years ago. One tomb contained an entire suit made out of jade, to assure the physical immortality of its owner. In Central America, the Olmecs, the Mayans, and the Toltecs also treasured jade and used it for carvings and masks. The Aztecs instituted a tax in jade, which unfortunately led to the recycling of many earlier artworks. The Portuguese, who brought home jade pieces from their settlement in Canton, China, called jade piedre de ilharga , or stone of the loins, because they believed it to be strong medicine for kidney ailments. Jade objects brought back to Spain from the new world were called by the Spanish version of this phrase piedra de hijada . This became the French ejade and then, finally, jade. The ancient jade of China was what we today call nephrite jade: an amphibolite mineral. Today it is jadeite jade that is considered the real jade, commanding prices much higher than nephrite because it comes in much more vivid green colors and finer translucency. 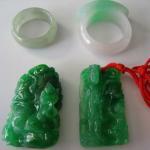 Jadeite jade is much rarer than nephrite: almost all the jadeite on the market comes from Burma. Jadeite dealers are some of the world&apos;s biggest gamblers: Boulders are sold intact, with only a tiny window cut in the side to expose a small section of the interior. The buyer has no idea what lies inside: valuable green jadeite or perhaps only white inexpensive white or brown jade. And boulders sell for hundreds of thousands of dollars. 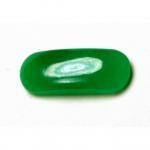 The top jadeite jade is usually cut into smooth dome shapes called cabochons. Jadeite bangles are also very popular in Asian countries. Beads are also very beautiful and some important jadeite necklaces made during the art deco period have fetched hundreds of thousands of dollars in auctions. Because of its smooth even texture, jade has long been a preferred material for carving. The most common shape is the flat donut-shaped disc called a pi, which is commonly worn as a necklace. Jadeite jade is most treasured for its vivid greens, but it also comes in lavender, pink, yellow, and white. The Emerald Buddha, the sacred image that is enshrined at Wat Phra Kaeo in Bangkok, Thailand, is actually beautiful emerald-green jadeite. Nephrite is found in less intense dark spinach greens, white, browns, and black. 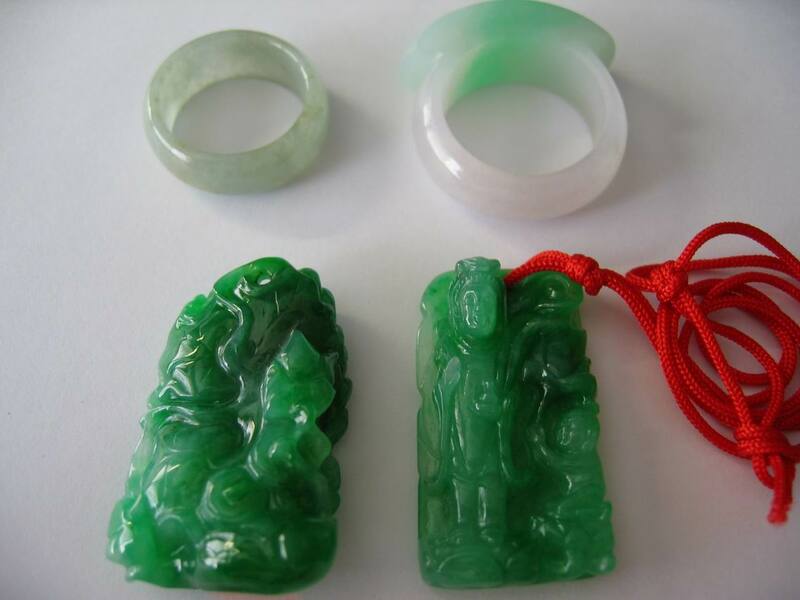 Both jadeite and nephrite are very durable and tough, although jadeite is slightly harder than nephrite due to its microcrystalline structure. Clean with mild dish soap: use a toothbrush to scrub behind the stone where dust can collect.